One of the few things that Overcooked 2 has with cooking in real life is that both activities are far more enjoyable with friends – and the additions made by Ghost Town Games in its manic kitchen simulator’s sequel will be sure to have you and three friends rolling in laughter. The manic kitchen co-op game is back with new levels, new recipes and the same comedic chops and hyperactive chaos that made the first such an instant classic. You’d initially be forgiven for thinking there’s not much new in the sequel. Every mechanic from the previous game is here, from the strong underlying core loop of time and team management, to the zany kitchens that will take even your best plans out for a spin. 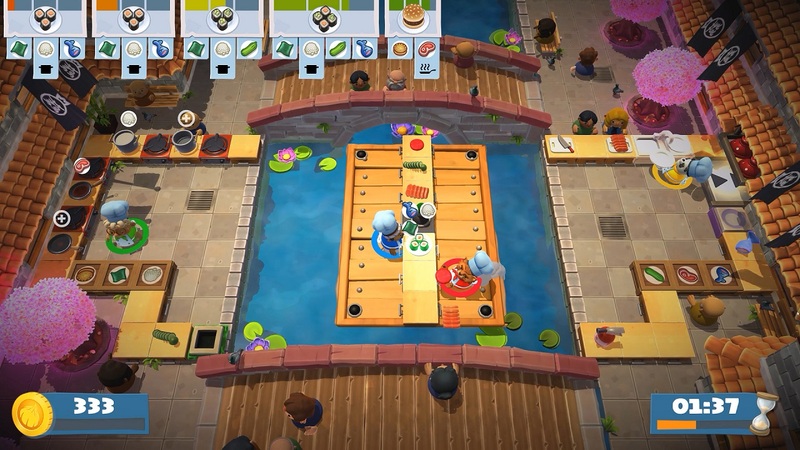 Each player takes the role of a chef, and you’ll be tasked with chopping up raw ingredients, cooking them for just the right amount of time, assembling dishes and washing up. For teams who have done and dusted all the challenges of the first game, Overcooked 2 will fit comfortably in your hands. 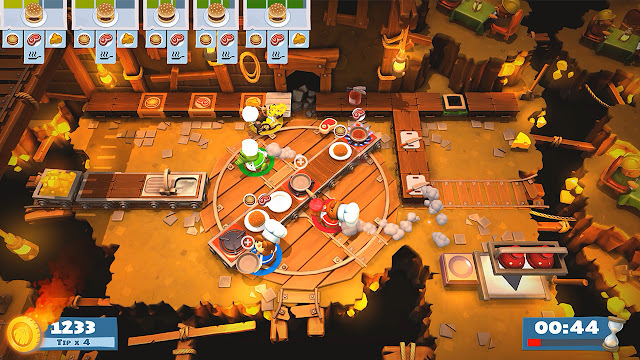 The added ability to throw food makes some of the terrain-switching levels easier affairs, but it also affords the ability to create levels with uncrossable gaps in which players will need to throw food back and forth. There’s no bonus for catching a teammate’s throw in midair but it feels great anyway, and unlike in a real kitchen there’s no worry of contamination if it drops onto the floor (evidently this is a world without a food safety inspector). Coordinated teams will be able to cut down their cooking time significantly, while more haphazard attempts will lead to cluttered benches and floors full of recklessly thrown food. That being said, there are a few levels which definitely feel limited because of the characters’ newfound propensity for catch – one early one that poses an issue involves two rafts floating down river rapids, one of which has the ingredients and a chopping board, the other of which has the frying pans, plates and delivery area. In a team of four, two players get placed on each raft and they never meet for the entirety of the level. That means two players will do nothing but chop and throw for a whole level, while the other two are busy managing a larger gamut of tasks on their own. In levels like these, there is far less possibility space for chaos, and it feels less engaging overall. 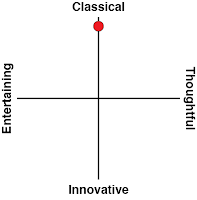 Thankfully these simple levels are few and far between, and all but disappear in the later worlds. Coordination is still key for success, and the common appearance of more complicated dishes such as pastas and burritos (where you’ll need to be frying your proteins on one side and boiling your carbs on another) as well as a few new level gimmicks will keep players on their toes. There’s less levels which feel outright aggravating such as the most devious ice and lava levels of the previous game, and more levels designed around memorable set pieces that will make your jaw drop with their creativity. Challenge now also comes in the form of a revamped scoring and rating system. While you’ll still earn up to three stars based on your performance, and you’ll still receive tips based on how quickly you complete orders, there’s now a combo system designed to multiply tips for teams who can queue up lots of meals to go out at once. Combined with throwing, it feels like players have much more freedom to innovate their game plans for each level and excel. 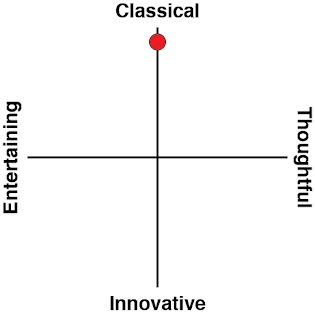 The two systems come together to fulfill the fantasy of being part of a well-trained team. I did feel that the threshold for three stars was lenient in most levels, and a lack of online leaderboards means that the best of teams will be playing just for pride. The game’s integration of online features is also a welcome plus. Players won’t be able to play the game’s campaign with strangers but can invite a few friends along as long as each one has an Internet-connected Switch and a copy of the game. Being able to play as a duo against other duos around the world in versus matchmaking is a great plus, and it’s encouraging to see developers encourage with mixing local and online play. While there’s a short selection of maps for Arcade and Versus at the moment, as well as no formal system for tracking wins or losses, the fun of the game is still there, and I am sure further DLC will expand upon the current offerings. Interestingly, because the online modes do not allow for voice chat, the game becomes a far more different experience than in couch co-op, where cooking commands would be yelled out with giddy abandon. Online, players can only communicate with pre-approved emotes, and will have to assume the other player’s intentions to fully collaborate on a dish. It’s a lot more dysfunctional than it sounds and caused me to stumble more than once in a while. It just goes to prove that Overcooked is still a game best suited to local multiplayer, and while I am sure there will be many who are happy that online is included in the sequel, you might not want to consider picking this up unless you’ve got a few buddies to power through the campaign with in person. The main story boasts a wealth of levels ranging across many different worlds and themes, and once the difficulty ramps up there are some truly satisfying challenges to behold. 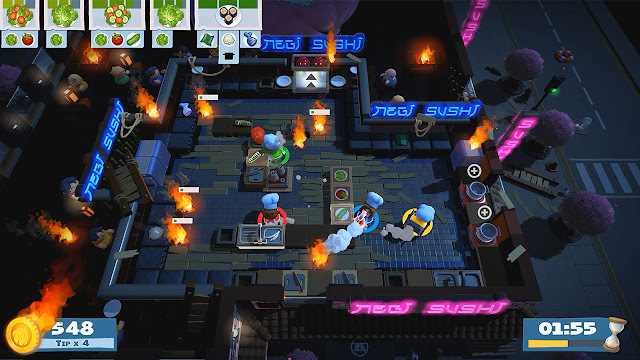 Without spoiling some of the more outlandish levels, there are a few designs which turn the whole ethos of the first game upon its head, and it’s clear that for the sequel, the developers were able to gestate on previous ideas in an optimised engine to deliver a more chaotic experience of the kitchen. 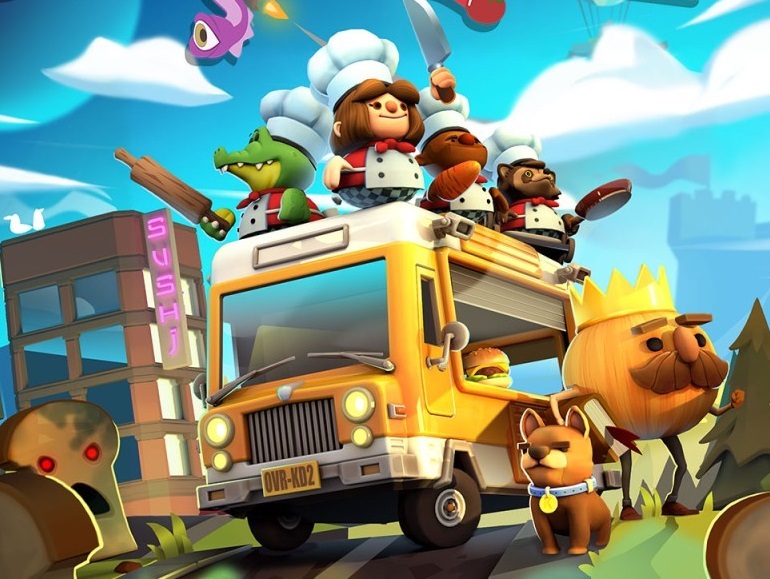 Whereas any other series would be derided for a sequel that was merely more of the same, Overcooked 2 demonstrates the series’ strong core mechanics and delivers another stellar experience to be had with friends. There is a very clear vision here, and it works on every front. The subtle additions of small mechanics further refine the formula the first game laid down so well, but ultimately your enjoyment of this game will boil down to the people you choose to share it with. For both masters of Overcooked and complete newcomers to video games, Ghost Town Games’ newest offering will be sure to delight.